I've also always been an artist, but only recently doing my own glassblowing. We built our own glass blowing equipment so that we could go out whenever we wanted and make some beautiful glass art right here at our studio. 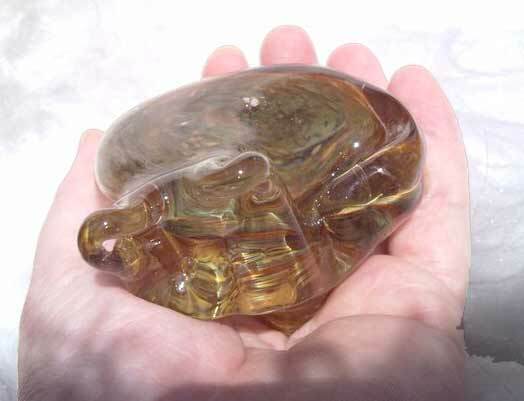 It was then that I realized that I could use my glass art to help myself and help others who had to deal with the tremendous heartbreak of losing a beloved pet. 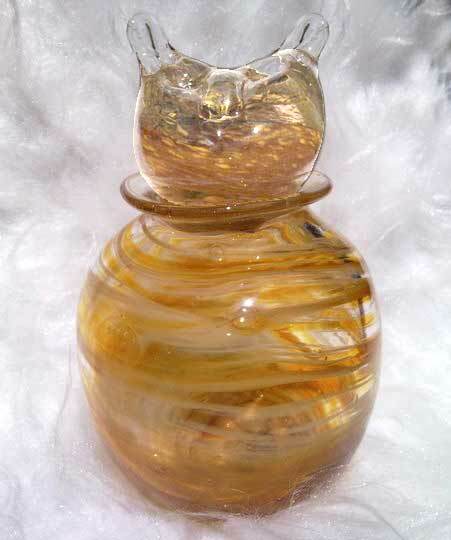 I could make urns and also paperweights and memorials that infused the ash into the glass art forever. So, I went looking for what other types of glass art memorials were out there. Too much? Not enough? What I found was that there were others, yes, but I could make mine a bit different. And mostly what I found were bland, repeatable imports from China - nothing that was handcrafted specifically FOR the pet owner, or their lost pet. I could do these, and even try to match the kitty colors of the lost pet with the colors of my glass. 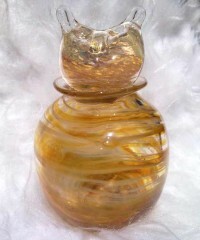 I started out with an urn, done in orange tabby colors, with a kitty face on the ball topper. This is about 6 inches tall, 4 inches wide and has the orange tabby swirls of color that look like fur. Very pretty. Then I went into the paperweights that would include a small sample of the lost pet's fur. This first one is handcrafted to look like a sleeping kitty, done in the colors of the lost kitty, with a small portion of the cremains included. A few weeks ago, I finished one for a lovely lady named Britton, who had recently lost her beautiful Jack Russell Terrier, Sadie. She wanted one of the round paperweights with some of Sadie's ashes included. After seeing Sadie's photos and hearing about her, a wonderful calm set over me while I created her piece. The colors were rich and dark, with just a few white streaks in them. 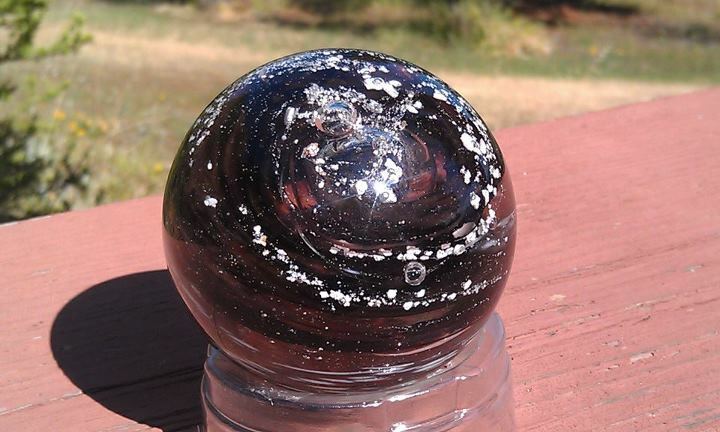 The ash captured little bubbles that looked like stars and I placed a larger bubble right at the top. It turned out beautiful. It turned out beautifu. I received this note back from Sadie's mom, Britton: "I wanted to say thank you. The memorial is so beautiful i can not even put it into words. It arrived on Saturday just in time for moving week. I cannot express the words of gratitude for what you have done for me. I have shared your name/website with everyone who comes into my vet clinic. You provide an amazing service and the words thank you just don't seem to be enough." Awww..... Sniff.... Sniff.... Making these memorials is bittersweet for me. I love that I can make them and help other pet lovers with the tremendous pain they're going through, but it's also so sad the reason that I make each one. And each one is made for the kitty, puppy, horse, rat, pet that is lost, with love, caring and my sincerest hope that it will bring peace and comfort to the grieving pet mom and dad.